For example, if the ﬂow rate of liquid going into the vessel was 450 gallons per minute, and the constant ﬂow rate drawn out of the vessel was 380 gallons per minute, the volume of liquid contained within the vessel would increase over time at a rate equal to 70 gallons per minute: the diﬀerence between the in-ﬂow and the out-ﬂow rates. The amount of liquid volume accumulated in the vessel (∆V ) between time 0 and time T is equal to the sum (∫) of the products (multiplication) of diﬀerence in ﬂow rates in and out of the vessel (Qin − Qout) during inﬁnitesimal increments of time (dt). In the given scenario of a liquid level control system where the out-going ﬂow is held constant, this means the level will be stable only at one in-coming ﬂow rate (where Q in = Qout ). At any other controlled ﬂow rate, the level will either be increasing over time or decreasing over time. This process characteristic perfectly matches the characteristic of a proportional-only controller, where there is one unique output value when the error is zero (PV = SP). We may illustrate this by performing a “thought experiment” on the liquid level-control process shown earlier having a constant draw out the bottom of the vessel. 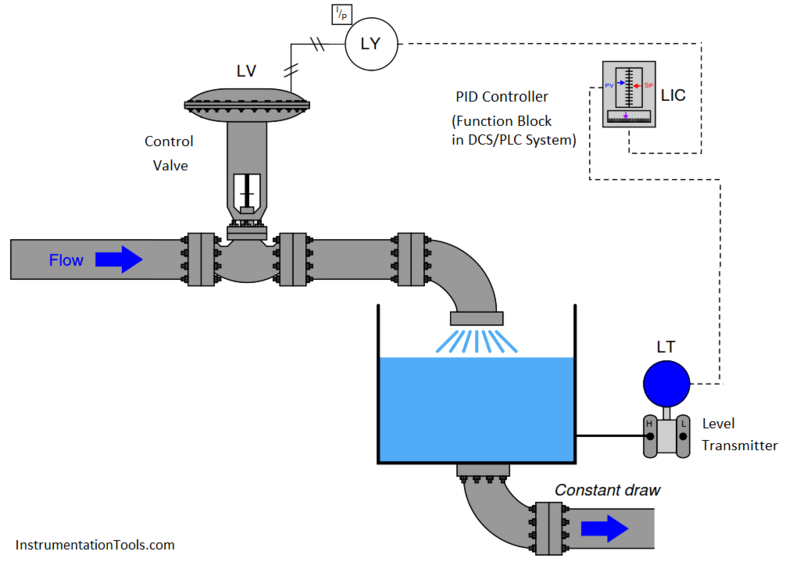 Imagine this process controlled by a proportional-only controller in automatic mode, with the bias value (b) of the controller set to the exact value needed by the control valve to make in-coming ﬂow exactly equal to the constant out-going ﬂow (draw). 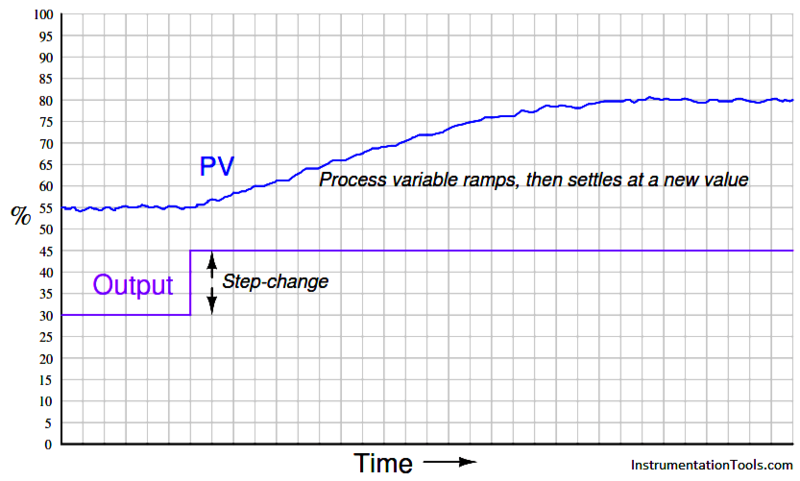 This means that when the process variable is precisely equal to setpoint (PV = SP), the liquid level will hold constant. If now an operator were to increase the setpoint value (with the controller in automatic mode), it would cause the valve to open further, adding liquid at a faster rate to the vessel. The naturally integrating nature of the process will result in an increasing liquid level. As level increases, the amount of error in the controller decreases, causing the valve to approach its original (bias) position. When the level reaches the new setpoint, the controller output will have returned to its original (bias) value, which will make the control valve go to its original position and hold the level constant once again. Thus, a proportional-only controller will achieve the new setpoint with absolutely no oﬀset (“droop”). The more aggressive the controller’s proportional action, the sooner the integrating process will reach new setpoints. Just how much proportional action (gain) an integrating process can tolerate depends on the magnitudes of any time lags in the system as well as the magnitude of noise in the process variable signal. Any process system with time lags will oscillate if the controller has suﬃcient gain. Noise is a problem because proportional action directly reproduces process variable noise on the output signal: too much gain, and just a little bit of PV noise translates into a control valve whose stem position constantly jumps around. Purely integrating processes do not require integral control action to eliminate oﬀset as is the case with self-regulating processes, following a setpoint change. The natural integrating action of the process eliminates oﬀset that would otherwise arise from setpoint changes. More than that, the presence of any integral action in the controller will actually force the process variable to overshoot setpoint following a setpoint change in a purely integrating process! Imagine a controller with integral action responding to a step-change in setpoint for the liquid level control process shown earlier. As soon as an error develops, the integral action will begin “winding up” the output value, forcing the valve to open more than proportional action alone would demand. By the time the liquid level reaches the new setpoint, the valve will have reached a position greater than where it originally was before the setpoint change , (NOTE) which means the liquid level will not stop rising when it reaches setpoint, but in fact will overshoot setpoint. Only after the liquid level has spent suﬃcient time above setpoint will the integral action of the controller “wind” back down to its previous level, allowing the liquid level to ﬁnally achieve the new setpoint. NOTE : In a proportional-only controller, the output is a function of error (PV − SP) and bias. When PV = SP, bias alone determines the output value (valve position). However, in a controller with integral action, the zero-oﬀset output value is determined by how long and how far the PV has previously strayed from SP. In other words, there is no ﬁxed bias value anymore. Thus, the output of a controller with integral action will not return to its previous value once the new SP is reached. In a purely integrating process, this means the PV will not reach stability at the new setpoint, but will continue to rise until all the “winding up” of integral action is un-done. This is not to say that integral control action is completely unnecessary in integrating processes – far from it. If the integrating process is subject to load changes, only integral action can return the PV back to the SP value (eliminate oﬀset). 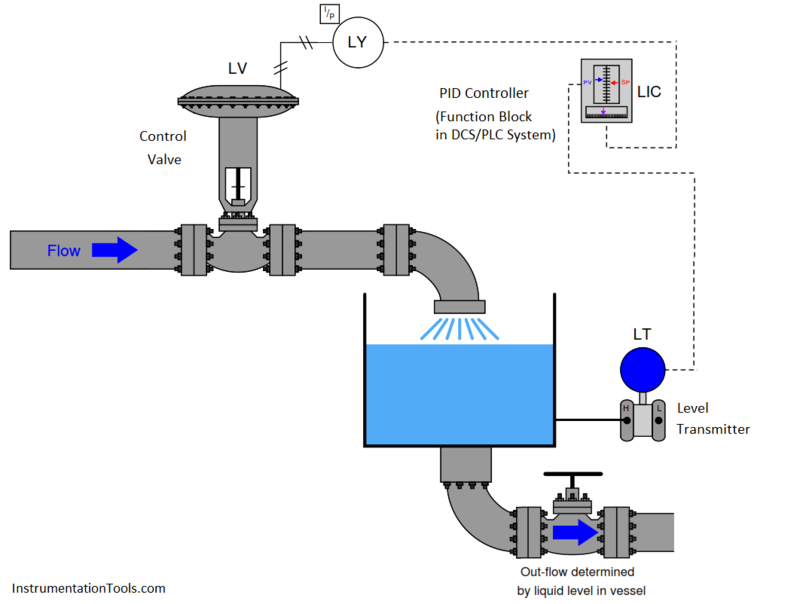 Consider, in our level control example, if the out-going ﬂow rate were to change. Now, a new valve position will be required to achieve stable (unchanging) level in the vessel. A proportional-only controller is able to generate a new valve position only if an error develops between PV and SP. Without at least some degree of integral action conﬁgured in the controller, that error will persist indeﬁnitely. Or consider if the liquid supply pressure upstream of the control valve were to change, resulting in a diﬀerent rate of incoming ﬂow for the same valve stem position as before. Once again, the controller would have to generate a diﬀerent output value to compensate for this process change and stabilize liquid level, and the only way a proportional-only controller could do that is to let the process variable drift a bit from setpoint (the deﬁnition of an error or oﬀset). The example of an integrating process used here is just one of many possible processes where we are dealing with either a mass balance or an energy balance problem. “Mass balance” is the accounting of all mass into and out of a process. Since the Law of Mass Conservation states the impossibility of mass creation or destruction, all mass into and out of a process must be accounted for. If the mass ﬂow rate into a process does not equal the mass ﬂow rate out of a process, the process must be either gaining or losing an internal store of mass. The same may be said for energy: all energy ﬂowing into and out of a process must be accounted for, since the Law of Energy Conservation states the impossibility of energy creation or destruction. If the energy ﬂow rate (input power) into a process does not equal the energy ﬂow rate (output power) out of a process, the process must be either gaining or losing an internal store of energy. In a self-regulating process, the control element (valve) exerts control over both the in-ﬂow and the out-ﬂow of either mass or energy. In the previous subsection, where liquid ﬂow control was the process example, the mass balance consisted of liquid ﬂow into the valve and liquid ﬂow out of the valve. Since the piping was essentially a “series” path for an incompressible ﬂuid, where input ﬂow must equal output ﬂow at any given time, mass in and mass out were guaranteed to be in a state of balance, with one valve controlling both. This is why a change in valve position resulted in an almost immediate change and re-stabilization of ﬂow rate: the valve exerts immediate control over both the incoming and the outgoing ﬂow rates, with both in perfect balance. Therefore, nothing “integrates” over time in a liquid ﬂow control process because there can never be an imbalance between in-ﬂow and out-ﬂow. In an integrating process, the control element (valve) exerts control over either the in-ﬂow or the out-ﬂow of mass or energy, but never both. Thus, changing valve position in an integrating process causes an imbalance of mass ﬂow and/or energy ﬂow, resulting in the process variable ramping over time as either mass or energy accumulates in (or depletes from) the process. If we subject the control valve to a manual step-change increase, the ﬂow rate of liquid into the vessel immediately increases. This causes an imbalance of incoming and outgoing ﬂow, resulting in the liquid level rising over time. As level rises, however, increasing hydrostatic pressure across the manual valve at the vessel outlet causes the outgoing ﬂow rate to increase. This causes the mass imbalance rate to be less than it was before, resulting in a decreased integration rate (rate of level rise). Thus, the liquid level still rises, but at a slower and slower rate as time goes on. Eventually, the liquid level will become high enough that the pressure across the manual valve forces a ﬂow rate out of the vessel equal to the ﬂow rate into the vessel. At this point, with matched ﬂow rates, the liquid level stabilizes with no corrective action from the controller (remember, the step-change in output was made in manual mode!). Note the ﬁnal result of letting the outgoing ﬂow be a function of liquid level: what used to be an integrating process has now become a self-regulating process, albeit one with a substantial lag time. We may generalize all these examples of integrating processes turned self-regulating by noting the one aspect common to all of them: some natural form of negative feedback exists internally to bring the system back into equilibrium. In the mass-balance examples, the physics of the process ensure a new balance point will eventually be reached because the in-ﬂow(s) and/or out-ﬂow(s) naturally change in ways that oppose any change in the process variable. In the energy-balance examples, the laws of physics again conspire to ensure a new equilibrium because the energy gains and/or losses naturally change in ways that oppose any change in the process variable. The presence of a control system is, of course, the ultimate example of negative feedback working to stabilize the process variable. However, the control system may not be the only form of negative feedback at work in a process. All self-regulating processes are that way because they intrinsically possess some degree of negative feedback acting as a sort of natural, proportional-only control system. This one detail completely alters the fundamental characteristic of a process from integrating to self-regulating, and therefore changes the necessary controller parameters. Self-regulation guarantees at least some integral controller action is necessary to attain new setpoint values. A purely integrating process, by contrast, requires no integral controller action at all to achieve new setpoints, and in fact is guaranteed to suﬀer overshoot following setpoint changes if the controller is programmed with any integral action at all! Both types of processes, however, need some amount of integral action in the controller in order to recover from load changes. 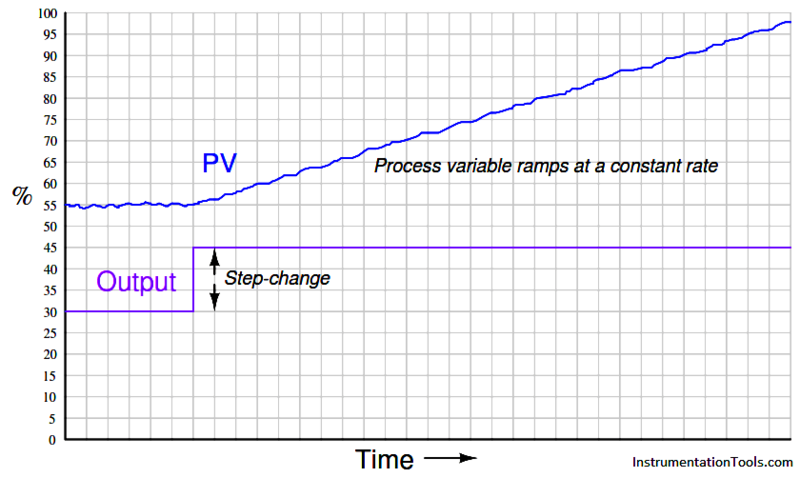 Integrating processes are characterized by a ramping of the process variable in response to a step-change in the control element value or load(s). This integration occurs as a result of either mass ﬂow imbalance or energy ﬂow imbalance in and out of the process. Integrating processes are ideally controllable with proportional controller action alone. Integral controller action guarantees setpoint overshoot in a purely integrating process. Some integral controller action will be required in integrating processes to compensate for load changes. The amount of proportional controller action tolerable in an integrating process depends on the degree of time lag and process noise in the system. Too much proportional action will result in oscillation (time lags) and/or erratic control element motion (noise). An integrating process will become self-regulating if suﬃcient negative feedback is naturally introduced. This usually takes the form of loads varying with the process variable.